Okay y’all know it’s not surprise that we love Halloween! We go crazy over couples costumes and we are so excited to jump into family costumes for as long as this little man will allow. 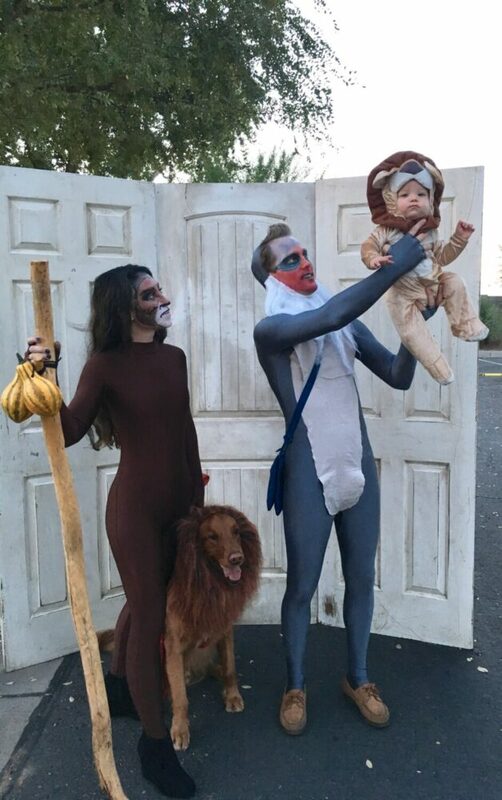 Unfortunately, he was only in his Simba costume for 10 minutes before he was too hot & sweaty (thanks arizona fall). He went nakey the rest of the night! Also don’t look too close at our makeup we were melting! Duke went as Mufasa and was quite the hit with the kids as we passed out candy. The biggest chatter came from the fact that Cameron was in a leotard! The whole night everyone kept asking me how I got him to wear it and how that was TRUE love… We both laughed because neither of us thought twice about wearing spandex out in public. If it’s for a costume we are ALL IN! Thank you to everyone who asked about Lulu. She is recovering and feeling much better. No activity for our little princess but she is enjoying all the attention and cuddles.